Break out your grills, lawns chairs and festive food, because it’s that time of year again—Independence Day is just around the corner! The Fourth of July is always a great day to celebrate our nation with friends, family and furry ones alike. Like many of us, you may anticipate catching a fireworks show at the end of the evening, or you may be planning to light up the sky yourself. While fireworks are a longstanding tradition for this summer holiday, for some pets, fireworks are not a reason to party, but a reason to panic. On and around the Fourth of July, the ASPCA Animal Poison Control Center (APCC) sees an increase in calls concerning pets who have ingested fireworks, or are having issues due to the loud noises they make. However, with a little planning, you can ensure that your four-legged friends enjoy the holiday just as much as you do. Use the shareable image below to remind your friends and family to be on the lookout for potential pet dangers this Fourth of July. 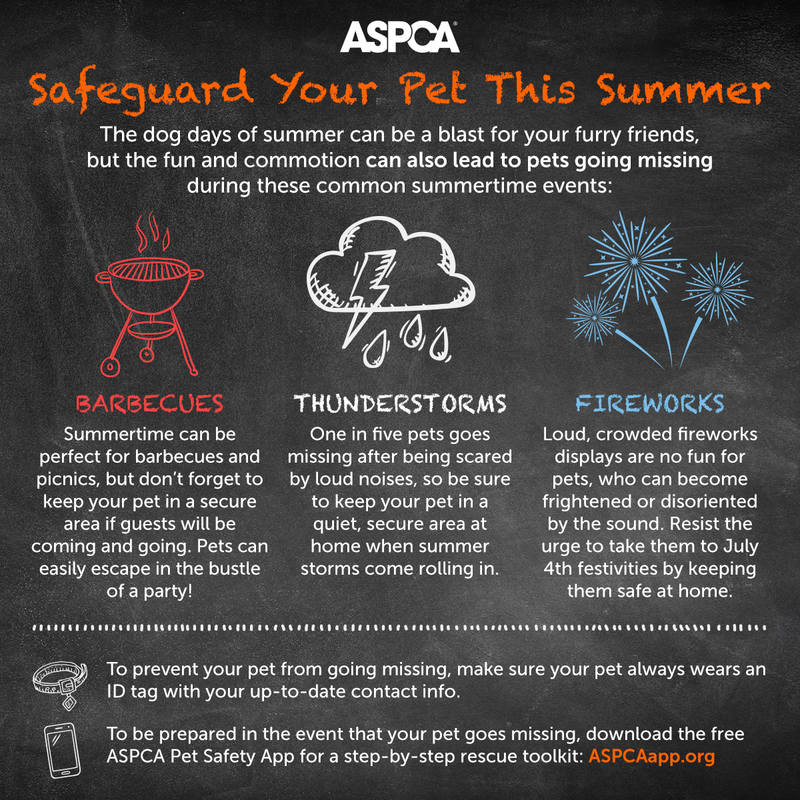 For more safety tips and helpful resources, like what to do if your pet gets lost during any summer festivities, download the ASPCA mobile app and the APCC mobile app to stay informed and aware year-round! If you have any reason to suspect your pet has ingested something toxic, please contact your veterinarian or the ASPCA Animal Poison Control Center immediately with our 24 hour hotline at (888) 426-4435.